Since our original post in February 2018, we have added a few more resources that you might consider trying with your students. Additionally, we have created a unit plan that uses many of our resources to help you teach a unit on Phase Changes and Heat Transfer. Students explore and explain behaviors of liquids and solids based on the individual particles in the states of matter and their intermolecular forces with The Behavior of Solids and Liquids activity, which also includes NGSS alignment. The activity, Categorizing States of Matter allows students to analyze both written statements and images that describe the properties of a solid, liquid or gas. They then determine which state of matter the description best describes and categorize it accordingly. Use The Temperature Guys video, which tells the story of how the concept of temperature have evolved, and how thermometers have changed since the 1600s, to give your students a better understanding of the different temperature units. This video includes an activity sheet with questions for your students to answer while they watch the video. Students take on the role of a forensic investigator and use lab results to help them determine if a suspect’s vehicle was potentially involved in a hit and run incident in The Search for a Hit and Run Suspect lab. They will collect data and complete calorimetric calculations to determine the specific heat capacity of multiple unknown metal samples in order to solve the crime. Students design and build a device capable of insulating an ice cube submerged in boiling water for two minutes in the Chemistry is Cooler Stress Challenge. This open-ended inquiry based activity requires students to critically think about structure and function of the materials they wish to use in order to build a device to solve a complex real-world problem. 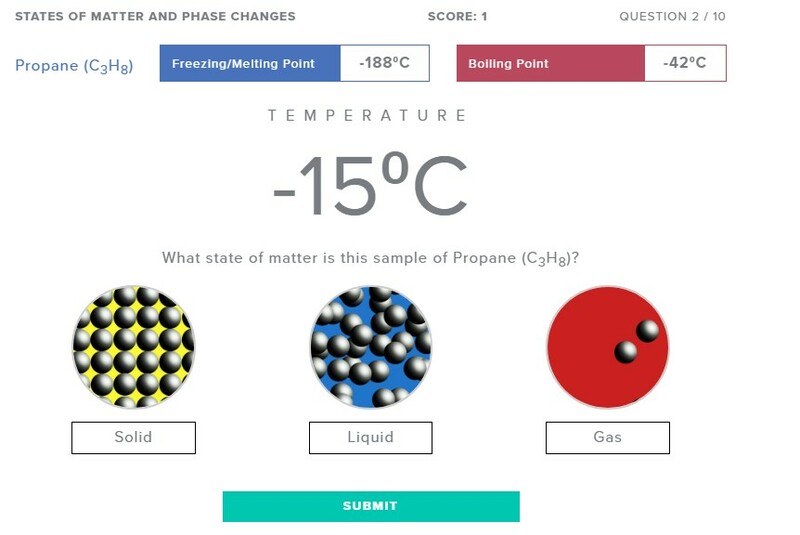 Assess student understanding of phase changes, as well as melting and boiling point data with an online quiz in the States of Matter and Phase Changes simulation. This activity includes questions that will challenge students to analyze data to identify the correct state of matter of a substance and then connect it with an animated particle diagram. We hope that these activities can help you to reinforce several of the topics covered in a unit about phase changes and heat transfer. Most of these lessons were made possible by great teachers who shared their own resources. We need your help to keep the collection growing. Do you have a great demonstration, activity, or lesson related to this topic that you would like to share with the community? Please send it along for consideration. How Much Energy is in Your Snack Food?